So here are the recipes. 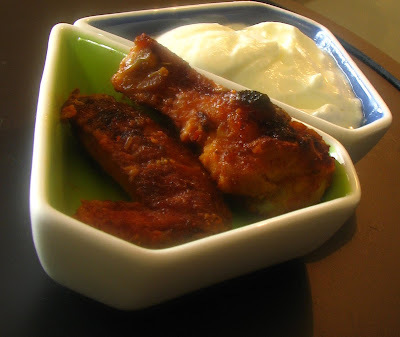 Make horizontal slits on the chicken wings so that the marinade can seep into it. Rub the marinade onto the chicken pieces and leave it for an hour. Preheat the oven to 200 degrees C. Bake the chicken wings for about 40 - 45min or so. The other chicken pieces will take about 15 min longer to cook than chicken wings Be sure to turn over the pieces after about half the time. Also keep basting the chicken with the marinade every 15 min or so. 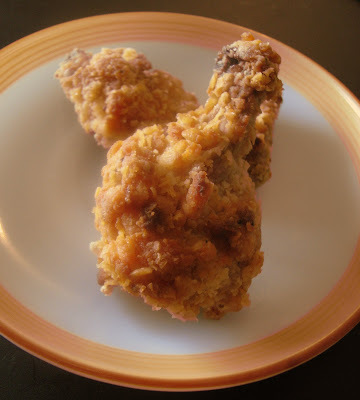 If you are going to deep fry the chicken, then heat some oil in a pan enough to cover the chicken pieces and then fry the chicken pieces on both sides till they are done. Serve with curd or marinade kept aside for dipping sauce. Serve with a salad for LCHF diet. Make horizontal slits on the chicken pieces. Mix the chicken pieces with salt and 2 tsp chilli powder and keep marinated for an hour. Dry roast the oats in a pan for about 5 minutes stirring continuously till the raw smell goes away. Make sure that the oats do not change colour but has a crunch to it after the roasting. Then add the plain flour as well and roast for another 10 seconds more and switch off fire. Immediately transfer this mixture to another bowl that is at room temperature and let it cool for about 5 min. You can omit this dry roasting if you are planning to fry the chicken. In the meantime beat the eggs with milk, salt and a pinch of chilli powder in another bowl. To the flour and oats mixture, add salt to taste, pepper and the remaining chilli powder. Dip one chicken piece in flour and oats mixture first and coat it well. Then dip the same chicken piece in the egg mixture and ensure that it is coated well. 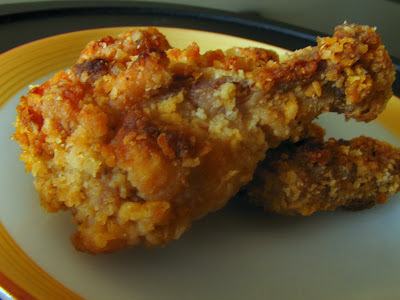 And then again dip that chicken piece into the flour and oats mixture and make sure that all the sides are well-coated. Keep mixing the oats and flour mixture after each dip to ensure that it is uniformly mixed. Else all the oats tend to be on top and the flour at the bottom. Repeat the same with all the chicken pieces. Place the chicken pieces on a roasting tray and drizzle the olive oil on top of the pieces. Preheat the oven to 200 degrees C and bake the chicken wings for 30 min - 15 min on either side For the other chicken pieces keep it about 15-20 min longer than chicken wings Be sure to turn them over after about half the time. In order to make the coating golden brown, crisp and cooked, turn the oven setting to grill after this and place the roasting tray on the top shelf and grill for 2-5 min on either side. This grilling is very important to the final taste and look of the dish. If you do not have the grill option in your oven, just place the baked chicken pieces on a iron griddle over a medium flame and dry roast it on either side for a couple of minutes till the coating gets a nice golden brown colour. If you are going to deep fry the chicken, then heat some oil in a pan enough to cover the chicken pieces and then fry the chicken pieces till they are a nice golden brown colour. Turn the pieces over to ensure even browning. A tip from my SIL and brother who tried this recipe. If you like it spicy and are planning to increase the amount of chilli powder used to marinate the chicken pieces, then it is a good idea to dry roast the chilli powder over a low flame before the using it. This will avoid any raw chilli powder taste in the final product. A closer look at the crunchy coating. Can you believe it? It is baked and yet it has such a crunchy coating. Hi Ammu Chechi.I found your recipie very attractive!! !I am thinking of trying it.. Cool! Do let me know how it turns out! The first one is really easy.. just marinate and fry (or bake)! And compared to the 42km marathom u just completed, this is gonna be a piece of cake (er.. chicken :P)! oh that's a nice twist to the recipe :) omit the oregano and u get tandoori style :) I'm sure Oregano will be there in the super-markets there. We always get it with Dominos pizza here in the small sachets. That fried chicken looks so good!!! though I don't eat chicken anymore but sometimes it looks so appealing to my eyes! thanks for following!!! I'll keep reading your post! Yum! KFC and Nandos all together!